Bermuda shorts, also known as walking shorts or dress shorts, are a particular type of short trousers, worn as semi-casual attire by both men and women. The hem, which can be cuffed or un-cuffed, is around 1 inch above the knee. They are so-named because of their popularity in Bermuda, a British Overseas Territory, where they are considered appropriate business attire for men when made of suit-like material and worn with knee-length socks, a dress shirt, tie, and blazer. They are considered more appropriate in hot subtropical and tropical climates than the typical heavier clothing favored in Europe. Many businesses in the West today that have a business casual policy similarly allow this kind of clothing in the hotter seasons, especially in the United States and Australia. They are available in a variety of colours, including many pastel shades as well as darker shades. True Bermuda shorts are not to be confused with "capri pants" extending below the knee. Cargo shorts may be a similar length, but are typically baggy or less "tailored" than Bermuda shorts, and more typical of West Coast American and Australia fashion. 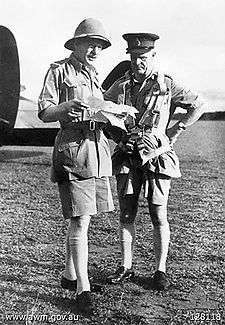 Bermuda shorts originated with the British Army for wear in tropical and desert climates, and they are still worn by the Royal Navy. During the Second World War there was a shortage of clothing in Bermuda. According to Jack Lightbourn, former Executive Vice President of the Bank of Bermuda, the general managers of the two banks in Bermuda, The Bank of Bermuda Ltd and The Bank of N.T. Butterfield and Sons Ltd were concerned that their male employees would not have suitable clothing to wear. They arranged for a local tailor to make two pairs of shorts, modeled on the shorts of the British military, for each of their male employees. The shorts were made from a very itchy grey flannel material, and each employee was supplied with two pairs of heavy grey wool long socks to wear with the shorts. This was the beginning of Bermuda shorts as business attire in Bermuda. In the post war period local merchants such as Trimingham Bros. and H.A. & E. Smiths improved the design of the shorts and used bright coloured materials as the shorts became more popular. ↑ "Archived copy". Archived from the original on 2009-12-13. Retrieved 2009-12-08. Wikimedia Commons has media related to Bermuda shorts. Bermuda shorts — from "Bermuda Online" by the Royal Gazette.